On May 28, 1807, Swiss paleontologist, glaciologist, and geologist Jean Louis Rodolphe Agassiz was born, who is considered a prominent innovator in the study of the Earth‘s natural history. 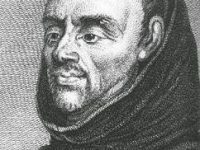 He was the first to scientifically propose that the Earth had been subject to a past ice age. 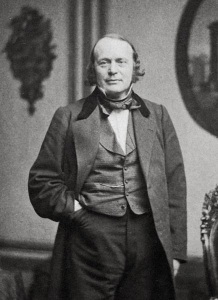 Louis Agassiz studied medicine at the universities of Zurich, Heidelberg, and Munich, but educated himself also in nature sciences and botany. To his early mentors belonged Alexander von Humboldt and Georges Cuvier, who motivated the young scientist to keep up his interest in geology, zoology and ichtyology. In the 1820’s, Agassiz undertook a research journey to Brasil to study fish, which depicted a turning point in his career. 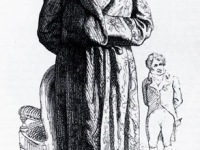 After Johann Baptist von Spix, who joined his travel, passed away, Agassiz was asked to complete the researcher’s studies which he gratefully did. Several publications followed the trip and Agassiz’ reputation across the continent grew. While being occupied as professor in Neuchâtel, Louis Agassiz proceeded his research on fish and fossils at the Swiss canton of Glasrus, which depicted the foundation for his later works that made him internationally famous. For many decades, researchers tried to find out how boulders were transported over quite large distances, especially in the foothills of the Alps. Several scientists already thought of glacier-activities but had difficulties to prove their ideas. The common explanatory approach was volcanic processes. In 1787 Bernhard Friedrich Kuhn had already suspected glacier activity as the cause and the Scottish geologist James Hutton had come to a similar conclusion. However, their theses met with just as little acceptance as those of the natural scientist Albrecht Reinhard Bernhardi (1797-1849), who had already argued in an article in 1832 that an ice cap had once extended over Europe, reaching as far as Central Germany. Other scientists believed that these huge boulders were carried on ice floes from the north to their present sites during floods. It was assumed that the erratic blocks in the foothills of the Alps had been carried by large floods from the Alpine peaks to the foothills. In the 1830’s Karl Friedrich Schimper mentioned his theories on a possible ice age and therefore a solution to the boulder problem. Louis Agassiz visited the researcher during his scientific journey to the Black Forest and was finally convinced by Schimper’s ideas. They began working on the topic together and Agassiz presented their results on the ice age theory in Switzerland in 1837 dramatically. Firstly, Louis Agassiz did not find many supporters, wherefore he put further work in researching and proving his proposition. For the next 5 years, Agassiz traveled to glacier areas observing their structures and possible movements. In further publications, he explained his new and improved studies. He described the movements of glaciers and their historical importance to the Alpine area, as well as clarified how certain areas were once completely covered in ice. Louis Agassiz then began working together with William Buckland, finding out how Scottland, England and Wales were formed by glaciers, which they also published. Unfortunately, their theories were not immediately accepted throughout the scientific community and beyond. However, after decades of attempting to convince his fellow researchers and several publications, more and more scientists began to focus on his subject as well. 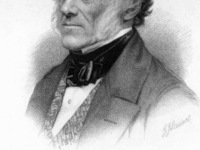 One of the most skeptic researchers was Charles Lyell, who at first supported Agassiz but later rejected his theories for several years. A few years after Louis Agassiz’ passing, many scientists were finally convinced by the ice age theory and it slowly reached everyone across Europe, an achievement which Louis Agassiz is mostly remembered for today. In 1842–1846 Agassiz issued his Nomenclator Zoologicus, a classified list, with references, of all names employed in zoology for genera and groups — a work of great labour and research. After an invitation from J. A. Lowell, at the Lowell Institute in Boston, Massachusetts, to the U.S., Agassiz decided to settle there. His engagement for the Lowell Institute lectures precipitated the establishment of the Lawrence Scientific School at Harvard University in 1847 with him as its head. 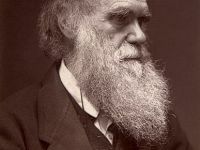 Harvard appointed him professor of zoology and geology, and he founded the Museum of Comparative Zoology there in 1859 serving as the museum’s first director until his death in 1873. During his tenure at Harvard, he was, among many other things, an early student of the effect of the last Ice Age on North America.